How to find the latest news on your meal or a mate? Use a cell-phone, if you are a techno type of bat! Social learning is something we all do and we also find it interesting in other animals. Foraging and mate-choice are the usual animal behaviours that utilise social cues. The social element at least makes sure that another individual finds the information useful. Fringe-lipped bats, Trachops cirrhosis, from the Soberanı´a National Park in Panama, were captured by net in 2011 (18 males were collected) and fed during the experiments in a 5x5x2.5m cage. An observer, leaf litter and a shelter were placed in the cage to furnish it suitably for the bats. It was simple for the bats to be trained to return to the shelter, and after their interesting adventure, all were returned to their capture site so that they could transmit stories of their undoubted successes with new technology! Prey cues were given to bats in, "training," using 2 cell-phone ringtones that were chosen to resemble the duration and frequency of the local tu´ngara frog, Physelaemus pustulosus . This made them more confident, it seems, with approaching novel prey cues that always gave them rewards. Individuals could copy other bats in their choice when and if rewards did appear. When you use energy and time in responding to a cue, lack of reward would mean a costly trip. This means attempted predation of the bat, use of limited energy resources or several other possible costs would create "dissatisfaction." In fact the bats were quite different in their response. In general, the bats approached novel cues and didn't mind where it was situated. Some bats did not fit this pattern, probably because of their experience previously in the wild. Males were often captured together, showing that they could have been interacting or transferring information in the wild. Communication could take place by sound (for example, the sound of chewing) or perhaps by smell, according to Patricia Jones, the lead author. It comes down to a kind of culture that an animal species may pass on, whether to offspring only or throughout a population, depending on the group-size. The authors were keen to discover when such social information is used. The ringtones simply filled the need for a totally novel stimulus. This could be used by the bat's acoustic sense in the same way as any other new stimulus would be appreciated in the wild. Patricia L. Jones, Michael J. Ryan, Victoria Flores and Rachel A. Page present their findings as, "When to approach novel prey cues? 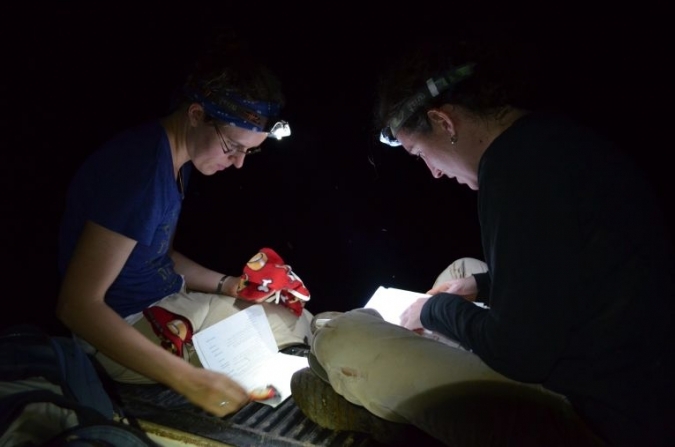 Social learning strategies in frog-eating bats," in the Proceedings of the Royal Society B. With the cooperation of the Smithsonian Tropical Research Institute in Panama, the work was carried out while they were based at the Universities of Texas and Chicago and at the Institute.